My last post looked at the disappearing towns of the Milwaukee Road in central Montana’s Meagher County. Those themes of a railroad, town creation, and abandonment were constant in several posts as I traced the imprint of the Milwaukee on Montana’s landscape in the 20th century. 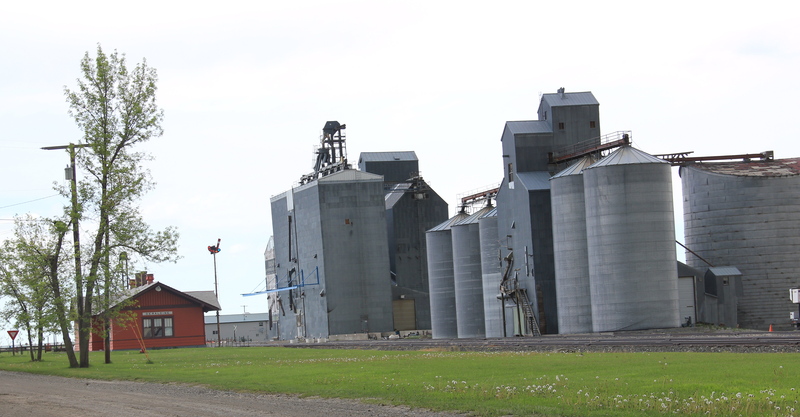 However, not all central Montana plains towns tied to the Milwaukee Road have disappeared–Geraldine in Chouteau County is one of those exceptions. 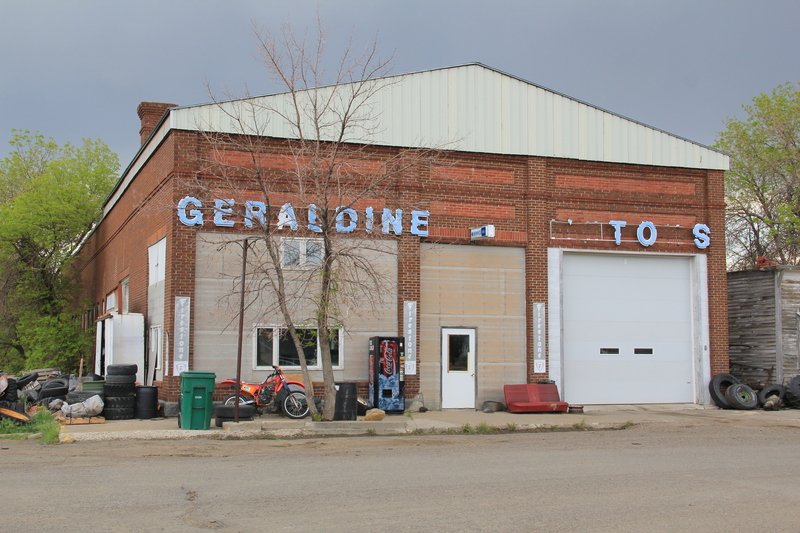 Geraldine was established c. 1913 along a major spur line of the Milwaukee Road that connected its division point at Harlowtown to the much larger railroad transportation center of Great Falls to the north. Due to the richness of the high plains agriculture of southern Chouteau County–the land south of the Missouri River–and the commitment of its citizens, Geraldine has remained generally solid through the decades. According to census records, the town has never topped 400 residents, 375 being the largest number of residents, and now, according to the 2010 count, there are only about 100 less, a little over 260 residents. Losing what amounts to 25-30% of the population over the 100 years sounds like a disappearing town, true, but in an eastern Montana perspective, it is not. As this blog has documented at many places, too many plains country towns have lost 50% or more of their population in just the last 30 years. In the 1984-85 historic preservation survey, Geraldine impressed me for several reasons. 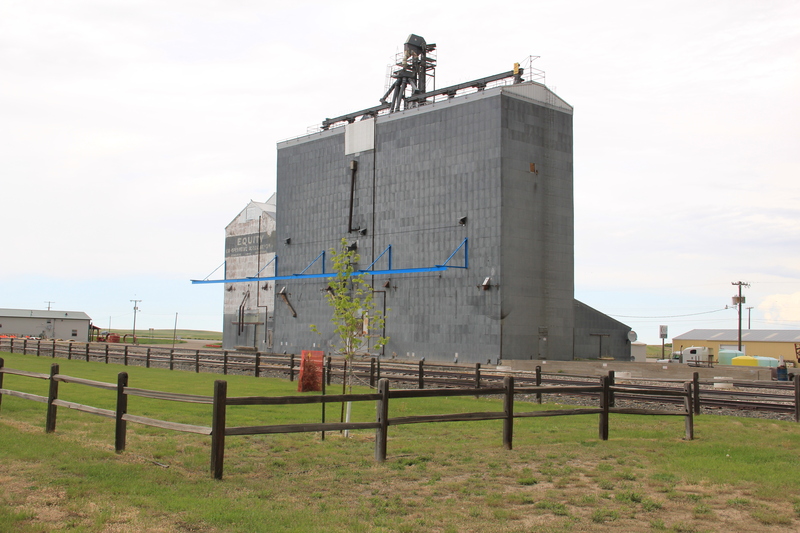 First was the dominating presence of the grain elevators, as seen above and with the first photo in this blog. 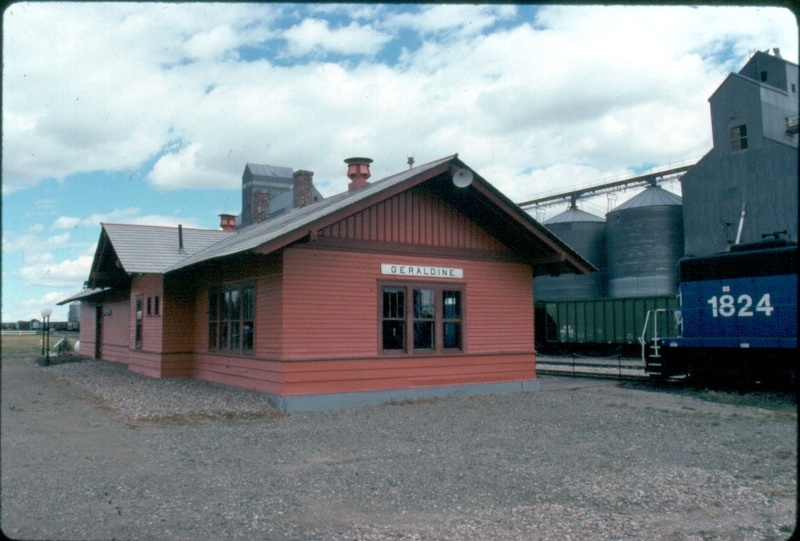 I had grown accustomed to Milwaukee Road towns where the corporate standardized design for the combination depot–a building that joined both freight and passenger operations–dominated the railroad corridor. 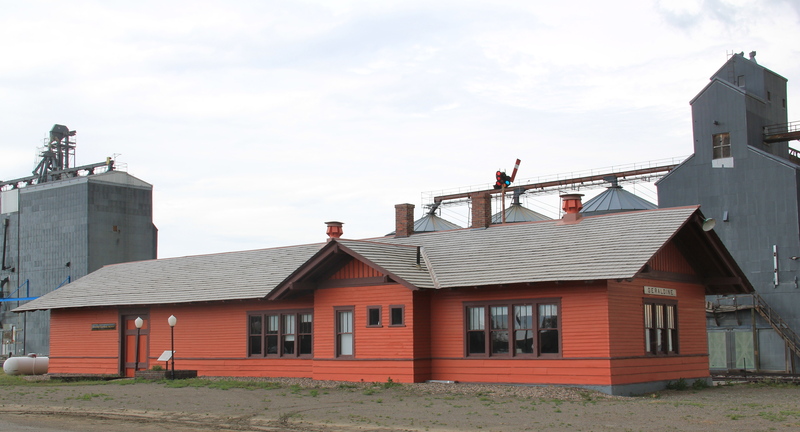 Here the elevators punctuate the skyline and loom over the town itself–the railroad created the need for them, certainly, but by the end of the 20th century the elevators were still viable businesses while the depot had become a local museum and community center. 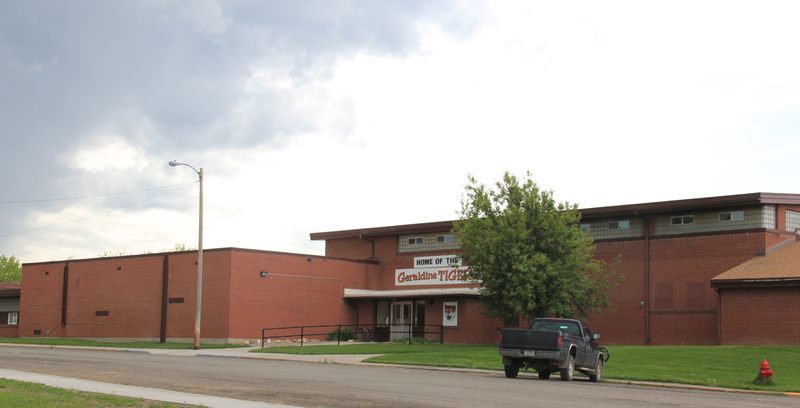 Geraldine school–home of the Tigers. This local school has several different building periods, as this image of its facade indicates, but maintaining a school district is vital to the town–plains country towns that lose their schools soon become abandoned places. Church, with its particularly notable tall concrete bell tower, mixing a bit of tradition with the new look of the postwar generation. 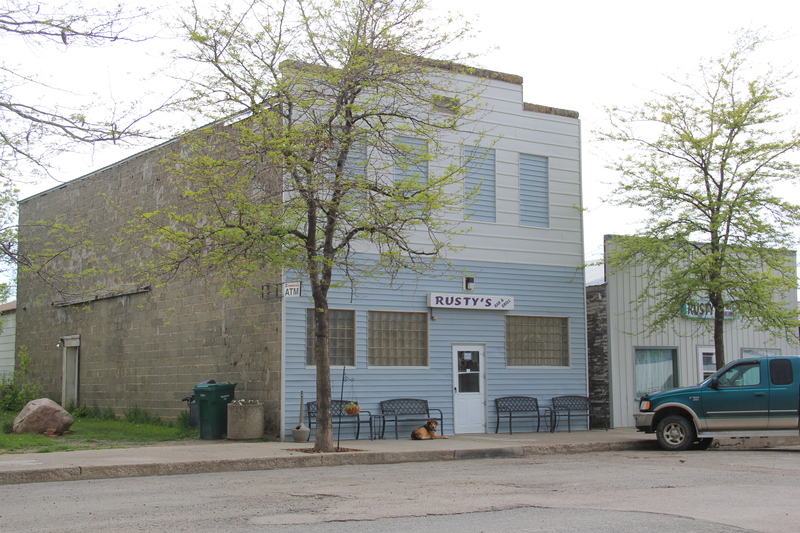 Geraldine of course has a classic western watering hole–Rusty’s Bar and Grill, completed with its front glass block windows. It is highly recommended–not much on the outside admittedly but a full community experience on the inside. 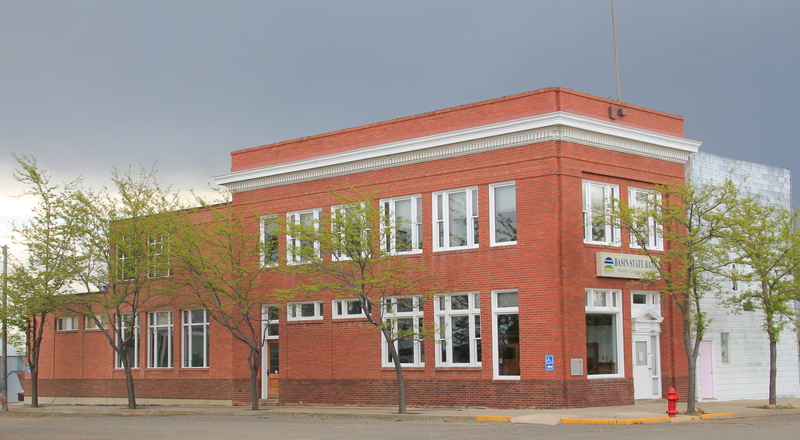 Historic depot and bank, modern-styled church, unique town plan, and great bar: more than enough reasons to come to Geraldine, not once but whenever travels take you between Great Falls and the Musselshell River Valley.